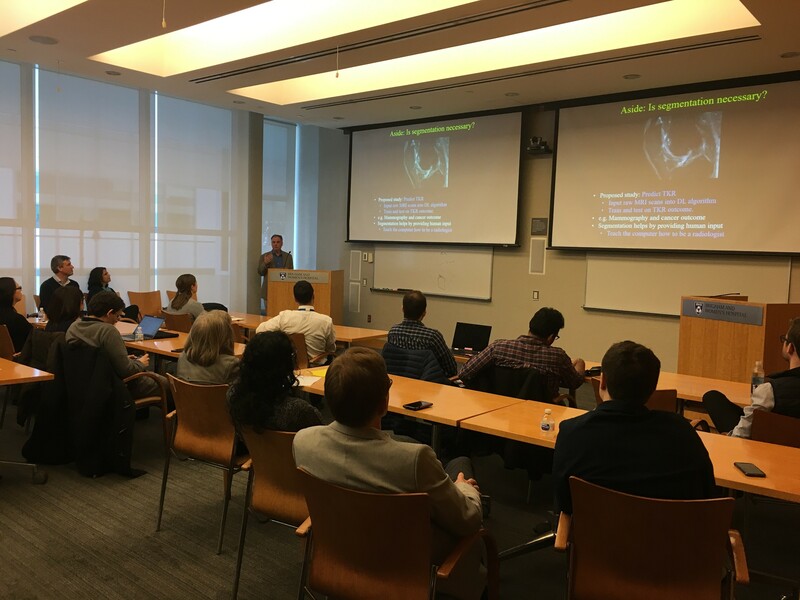 Over 40 registrants attended this second affinity group meeting for machine learning applied to radiological imaging. Made possible by the BRI NextGen awards, this event will occur quarterly to focus on machine learning methods as applied to research. The meeting began with formal talks from Tina Kapur, PhD, Kirti Magufa, MD, Irfanullah Haider, MD, and Jeff Duryea, PhD. The speakers offered their expertise from their diverse scientific backgrounds on subject matter such as image-based deep learning, datasets, and predicting disease states. Attendees and speakers talked freely of shared challenges and how they could collectively overcome them. During the lunch and open discussion that followed, there was a strong desire for a common platform that would allow researchers currently applying machine learning to their work or those who are interested in doing so to better connect and collaborate with each other. Several audience members spoke positively of collaborations that came about because of the first affinity group meeting and wanted this trend to continue. Plans for future meetings are already in the works. If you were unable to attend this session, keep an eye out for the next quarterly gathering!